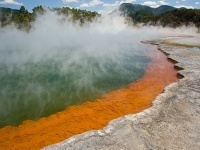 Wai-O-Tapu, meaning 'Sacred Waters', is a diverse and colourful geothermal sightseeing experience. The area has been active for more than 100,000 years and features thick pools of boiling mud that bubble and belch, geysers, sulphuric mineral terraces, and steaming pools that create a kaleidoscope of colour. Walkways around the area allow visitors to admire the display of some of the most incredible earth forces in the world. Some of the best features include the spectacular Champagne Pool, a large steaming and bubbling pool fringed by red and yellow ochre deposits; the evil looking Devil's Bath, with a high concentration of arsenic creating the vivid green colour of the water; and the erupting Lady Knox Geyser that shoots steam up to 64 feet (20m) into the air in a majestic daily display at around 10:15am. Address: The site is 17 miles (27km) south of Rotorua on SH5 (Rotorua Taupo Highway); 201 Waiotapu Loop Road.